The tomb of Ramesses IV (KV 2) in the Valley of the Kings is rather different than most other royal tombs built here. 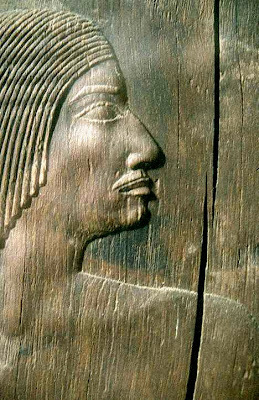 Ramesses III, had been assassinated, and when his some, Ramesses IV took the thrown, he did so in a period of economic decline in Egypt. Though large, his tomb is highly simplistic, and unique in many ways. The tomb was known early on, and was in fact used as a sort of hotel by early explorers such as Champollion and Rosellini (1829), Robert Hay, Furst Puckler, Theodore Davis and others. It was also an important Coptic Christian dwelling, and was also frequently visited in antiquity. 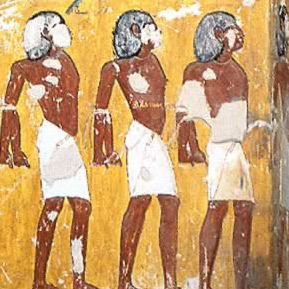 There was considerable Coptic and Greek graffiti on the tomb walls. Interestingly, two sketched plans of this tomb are known, the most famous and complete of which is contained within the a papyrus in Turin. One unusual aspect of the tomb is that there is very little decline as one travels from the first part of the tomb through to its rear. The entrance begins with a split stairways to either side of a ramp, opening into a first, second and third corridors. The final corridor leads to a smallish antechamber, and then to the burial chamber. To the rear of the burial chamber are some small annexes, but otherwise the tomb contains no lateral annexes. The corridors are unusual for their width and height, some measuring three meters (10 feet) wide and four meters (15 feet high). The facade of the tomb is decorated with scenes of the king's coronation, as well as a scene depicting Isis and Nephthys venerating the sun disk. 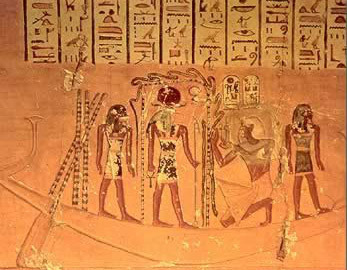 Within the first two corridors are scenes and text from the Litany of Ra, proceeded by a typical painting of the king worshipping the falcon headed sun god, Re-Horakhthy. On the ceilings are vultures, falcons and winged scarabs with spread wings. In the third corridor we find the first and second parts of the Book of Caverns, with simple ceilings decorated with stars, but which later becomes vaulted. From this corridor, a ramp leads through the antechamber into the burial chamber. The antechamber is decorated with scenes from the Book of the Dead, mostly chapter 125 which deals with the judgement of the dead. The burial chamber, which is not large, is almost filled by the still resident sarcophagus. However, this sarcophagus is unusually large. 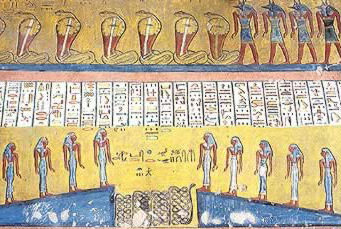 The burial chamber is decorated with the second, third and fourth hours from the Book of Gates. The ceiling is uniquely decorated with two large figures representing Nut, rather than the usual stellar constellations. There are also scenes from the Book of Nut, and the Book of the Night. The annexes behind the burial chamber contain text from the first part of the Book of Caverns. Other parts of this annex are painted with burial offerings such as beds, shrines and canopic jars. Note the complete absence of pillars within this tomb, as well as the lack of the Amduat within its decorative program. Little funerary equipment is known to have been found within the tomb itself. The sarcophagus was broken into at one end during antiquity and the lid displaced. 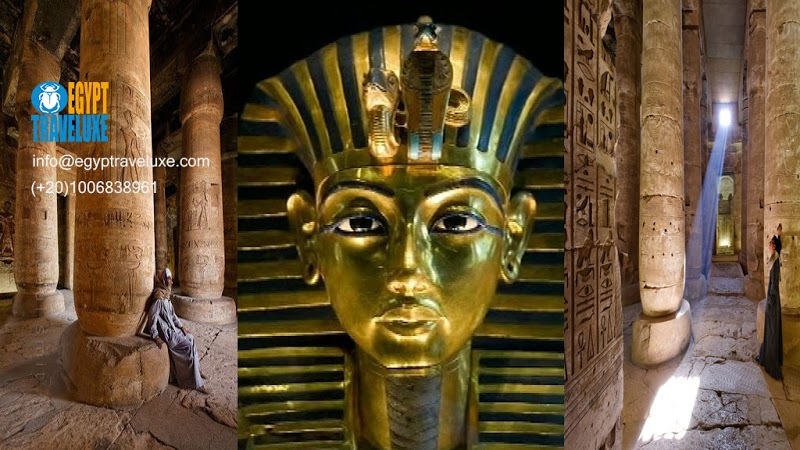 The king's mummy was eventually found in KV 35. 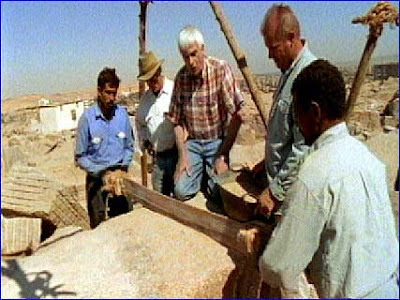 There were a total of nine foundation deposits discovered, including five by Howard Carter. Edward Ayrton and Carter also found considerable funerary material that was thrown out of the tomb, probably during antiquity. These included ostraca, shabtis figures in wood, calcite and faience, fragments of faience, glass and potsherds.